Sticks and Stones? A Veterinary Dental Story! I am frequently asked; “If my pet’s teeth are clean, do I need to provide a dental cleaning and assessment?” The answer will always be YES. The reason for that is the same reason we provide routine dental care for ourselves. We certainly don’t wait until there is a large accumulation of tartar and red gums before we schedule our own personal care. With the client’s permission, I will share a case that we recently treated. 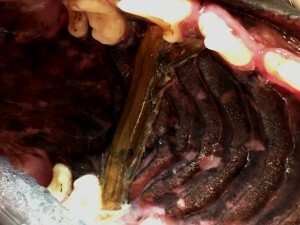 This relatively young dog was admitted for dentistry because of a persistent odor. 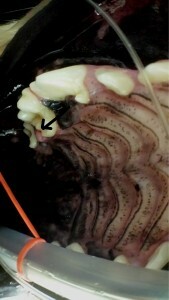 During the examination, the dog would not permit a very thorough examination of the oral cavity. The owners perceived that there was no signs of discomfort. But, in order to do a thorough assessment, despite the fact that the limited oral exam revealed relatively clean teeth, the veterinarian recommended a comprehensive oral health assessment and cleaning under general anesthesia. Once we fully anesthetized this patient, it was obvious what was causing the offensive odor. This dog was a stick chewer at times. And, as you can see in the images, one medium sized stick got lodged against his palate, firmly stuck between the right and left upper premolars. A piece of stick stuck between right and left upper premolars. Unfortunately, this created a large, deep, painful ulceration across the roof of his mouth and caused enough bone loss to necessitate extraction of some of the related teeth. There really is no saying how long that stick had been trapped there. 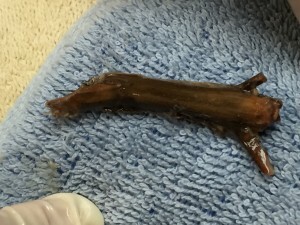 Fortunately, with proper care, the stick was removed and antibiotics and pain medications were provided for complete healing and case resolution. It is also important to note, this is not an unusual case. 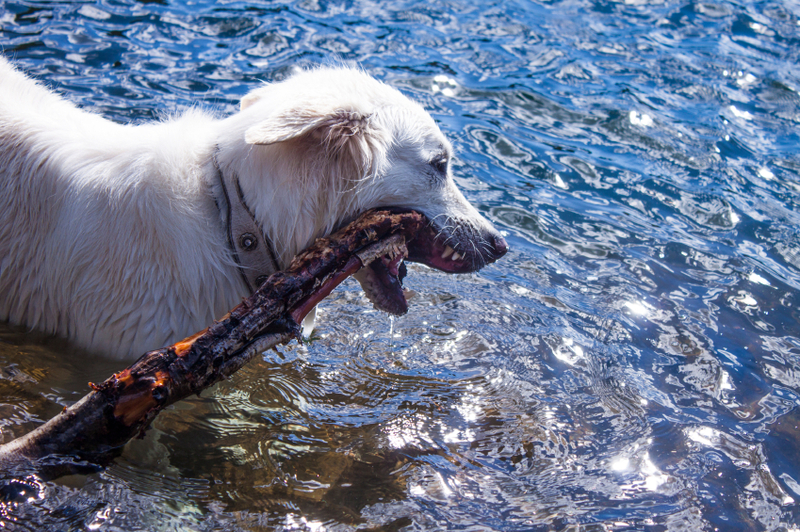 Dogs chew on all sorts of things and it is not uncommon for us to find pieces of toys, paper clips, pieces of plastic and trash. Our pets do not effectively demonstrate their pain. Foul odor almost always represents infection. Most importantly though, the teeth cleaning is not the most critical part of the recommendation for professional dental care under general anesthesia. The most important part is the assessment of the oral cavity and a detailed assessment of each tooth. A Golden Retriever had relatively little tartar or his teeth but the recommendation was made for a thorough assessment under general anesthesia. The black arrow in this picture points to a small tumor that we would have never otherwise detected until it had grown to larger and more dangerous proportions. Early resection provided complete resolution. 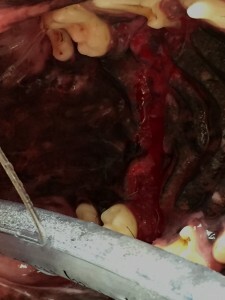 Small tumor hidden between the molars. And, if you are a veterinarian or technician reading this, these cases illustrate the importance of your recommending dentistry….even when the teeth look good. *If any of this information was useful or you would like to see similar content, “LIKE” the PetED Veterinary Education and Training Resources Facebook page and subscribe on the HOME page of the PetED website to receive upcoming newsletters and news. If you feel friends or colleagues would benefit from or enjoy this article, feel free to share on YOUR Facebook page.